The Pilates Method Alliance (PMA) not only promotes Pilates exercise, but is a certifying agency for Pilates teachers. This conference offers networking, research, workshops, classes, and the opportunity to take the Pilates certification exam. This three-day event claims to be the “most comprehensive yoga conference in the nation”. It boasts more than 20 presenters who cover meditation, anatomy, internal alignment, ways to introduce yoga to children, aqua yoga, and more. There are 36 workshops and 10 individual day-long intensives. Find a diverse selection of workshops that help instructors grow their knowledge and enhance their personal practice. All workshops are structured for optimal interaction between presenters and attendees. There are offerings for every level of yoga instructor. Each workshop is an intimate gathering, with 25 to 80 attendees. Gain insight on meditation techniques, mindfulness, philosophy, as well as business practices and marketing. There are networking opportunities and a marketplace with an assortment of health and wellness products. This conference has more than 200 sessions, including quiet meditation and positive teaching techniques presented by experts in the field. Enhance your understanding, clarity, and energy with a variety of yoga tools and practices. Pre-conference immersions begin on the Thursday before the weekend-long event. In addition to classes and instruction, there are performances during evening gatherings. 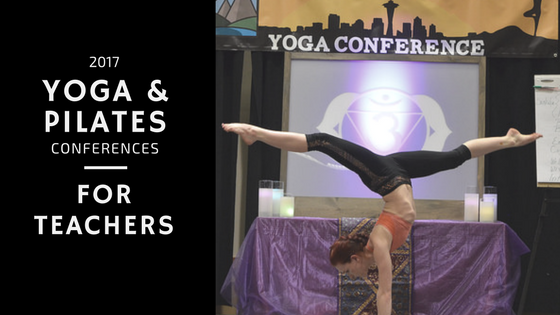 Billed as “Canada’s largest yoga experience,” this conference hosts 700 hours of sessions and 300 exhibitors offering more that 10,000 yoga items. Instruction is aimed at levels from beginner to advanced. Pick as many workshops and classes as you wish. The hourly rate you pay is based on the number of classes you select. Most certificate hours are commensurate with OYA, Yoga Alliance Continuing education credit, and Can Fit Pro. Attend the family-friendly Yoga Expo 2017 in either Fort Lauderdale or Los Angeles. At each event, local and national teachers offer a wide array of 50-minute classes for kids, beginners, and advanced yogis. The onsite marketplace features yoga apparel, accessories, and vegan food. One $35 ticket provides access to unlimited yoga classes and workshops, as well as live music stages.